Since legalization legislation is on the books for Spring 2017, if this passes into law, what would be the ramifications to companies and their drivers who cross the border? During the past Canadian election, a promise was made by the Liberal government to relax the existing Canada marijuana laws. The details are still being worked out but it is expected the government will legalize the recreational use and sale of marijuana. Most presumably it will control its distribution in a manner similar to alcohol. The details get murky from there. Firstly, the distribution and sale of alcohol is a provincial matter. In some provinces alcohol is sold via a government controlled, if not owned, retail network. In others, beer and wine are sold in a grocery store but you might have to go to a government sanctioned location to get the hard stuff. Then there is the question of age. The legal drinking age varies between 18 and 19 across the country. For medical reasons, the use of marijuana could be limited to those 25 years and over, which would disappoint a great number of current users and motivated Liberal Party voters. The voting age in Canada is 18. Regardless, I suspect this shouldn’t have a huge effect upon cross border drivers at all. For one, the United States has its own ambiguity regarding marijuana laws. According to Wikipedia, Alaska, California, Colorado, Maine, Massachusetts, Nevada, Oregon, and Washington have legalized marijuana possession for both medical and recreational use. However, Customs and Border agents operate at Federal level and have adhered to a no drug policy. In fact, at times border agents have been known to casually ask a Canadian travelling to the US on vacation if they have ever used marijuana. Amazingly, a significant percentage of Canadians will innocently respond, “…like sure I did go to high school” then subsequently be sent home to spend their vacation in Canada. How this affects the next state visit of the current Canadian Prime Minister (an admitted user) time will only tell. The great equalizer are the rules associated with being a truck driver in the United States. The Department of Transportation Office (DOT) Drug and Alcohol policy prohibits the use of marijuana. 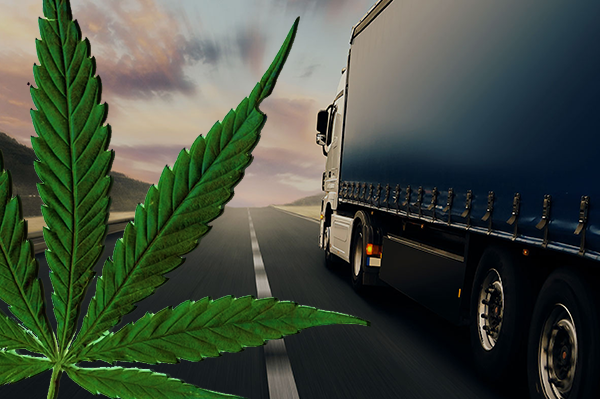 Since marijuana is detectable in your system for about 30 days, it is essentially off limits if you are a commercial truck driver. While Canadian truck drivers do not face the same drug testing in Canada, they are required to abide by the rules if they drive in the United States. This does not mean it is legal to drive stoned in Canada, but how do you determine if a driver is under the influence? Simply having THC in their system does not mean the driver was impaired at the time of the accident. In many cases I think it would be hard to determine if a driver is impaired merely by observation. For a habitual marijuana user, the only time they might appear to be high is when they are not. This implies the only safe stance until a foolproof test or THC level is established is to have a strict no use policy. However, the enforceability of such a stance may stand contrary to existing Canadian privacy rights laws. Perhaps another worry is US tort law. Take the example in which a driver is in the US and has an accident where he subsequently fails a drug test. So now the driver is liable, but what about the Canadian trucking company? Did the company have two policies, one for US drivers and another for Canadian drivers? Could the US driver be the victim of second hand dope smoke off hours while associating with their work comrades after hours? Were they confused and thought they just couldn't smoke while in the US? Perhaps a stretch but I am sure lesser arguments have resulted in unfavorable legal decisions…. Blogger Sean Jennings is International Operations Manager for TMW Systems.